Knight Villain is doing great. We recently went on a ride with our good friends Paula and Joe Bear to a neighboring farm to watch them school some cross country fences, and we got to explore some new trails and enjoy the sights and sounds of early spring. Paula and Joe arrived early and we loaded Knight in about five minutes (oh, how that ground work pays off). 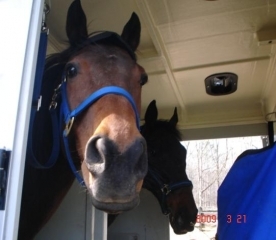 The ride in the trailer was uneventful and both horses arrived fresh and interested in their new surroundings. They could see the horses in the pasture next to the trailer and eagerly whinnied to them as we prepared to set off. Joe Bear and Paula school cross-country fences. 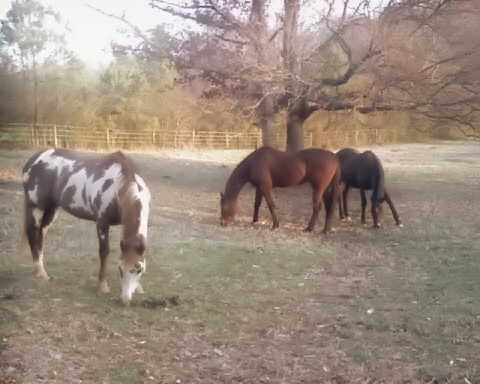 After a quick warm up in the arena, we were escorted to the trailhead by a couple of boarders and spent some time exploring the gentle hills and quirky little streams running through the property. Then it was time for Paula and Joe to hit the course. They flew over everything in sight with no hesitation and would gallop past us while Knight unconcernedly chewed on the grass. 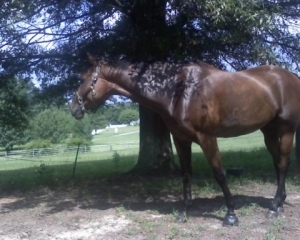 To those people who think that off-the-track thoroughbreds will explode and run off if another horse is moving by at speed, Knight proved them wrong. Even when Paula and Joe were testing their “extended canter”, Knight merely grunted under his breath and did a little jig. Nothing remotely out of the ordinary. We finished the morning with a gentle walk down the long driveway, just enjoying the beautiful spring day. 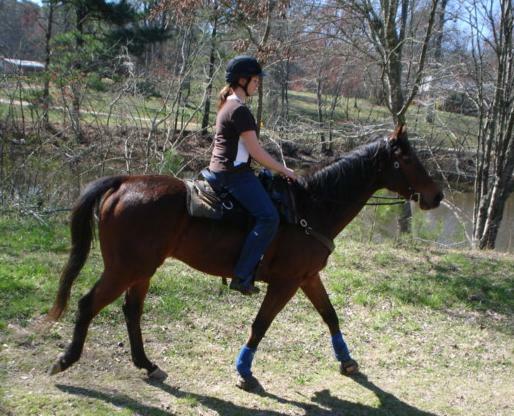 The best part of my OTTB experience is how calm and rational Knight has become. 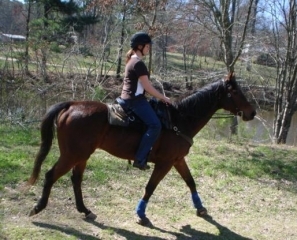 He is frequently ridden along a busy highway at peak traffic times, and has learned that nothing will hurt him. Now of course you still get the crazy idiot that will lay on the horn as he passes (always make sure your horse has heard a horn and knows how to “spook in place”) and the times that has happened, Knight has jerked in surprise, but always stands still and analyzes the spook, then turns his head to see me in the saddle as if to say “what do you want me to do?” He knows that he must look to me to move him in a safe direction, and not to make that decision himself. The coolest part about him is that he is not “bombproof” or so numb to his surroundings that he fails to react to things he should be scared of. My goal is to walk that fine line where I can trust him to make decisions about things I cannot see (a rotten plank on a bridge that he can feel gives too much under his feet, or a deer hiding in a thicket that is invisible to me) and where I can take the initiative to push him through something he is afraid of but that I know he can deal with. I like that he looks around and points out changes in the environment without becoming frozen with fear. 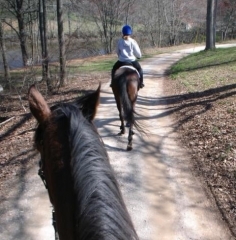 These are qualities a safe and reliable trail horse needs to possess. You’ll be happy to know that Knight’s leads are solid, he moves in balance on a loose rein, and will do flying changes when asked. We hardly spend any time in the arena, but I make a habit of practicing leg-yields and transitions (intergait and intragait) wherever we are. The fundamentals are still important, and making time to run through the basics makes for a respectful and responsive ride. Knight is a happy and confident Thoroughbred! His heart and courage continue to astound me every day and when I count my blessings, I count Knight twice.